Have you successfully recovered from Force Friday? Well, don't get too comfortable just yet! There's always more merchandise on the way. And today, we get a look at the exciting 3D glasses coming to RealD 3D movie theaters nationwide. 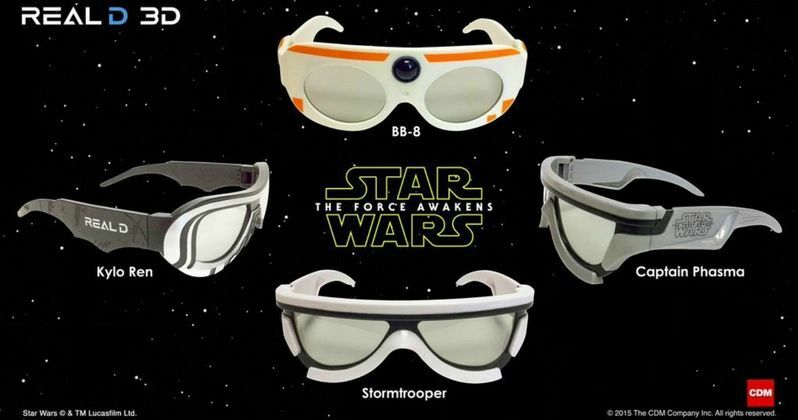 There are four different pairs of 3D glasses to choose from, all based on the new characters in Star Wars: The Force Awakens. Though, oddly enough, three out of the four are representing the villains in this adventure. Who do you get to choose from? Representing the light side of the force is new ball droid BB-8, who is proving to be a true fan favorite despite no one having yet seen what he does in the movie. We don't get any glasses based on Rey even though she dons a pretty cool pair of goggles that fans are already clamoring for and attempting to make themselves. Poe Dameron's X-Wing pilot isn't represented here, either. Though you have to imagine his X-Wing helmet would make for a pretty awesome set of orange 3D glasses. We do get a pair of Finn 3D glasses, kind of. He is an AWOL Stormtrooper, and their is a pair of First Order Stormtrooper glasses included in this fun set. Representing the dark side of the force are new villains Kylo Ren, whose glasses will probably be the most popular, as his action figure was the first to sell out on Force Friday. Coming in a close second is Captain Phasma, who wears a shiny chrome Stormtooper outfit. Again, if you are planning on ordering any of these glasses, tread with caution. You have yet to see any of these characters in action. You may end up really hating one of them. No one wants to admit it now, but Jar Jar Binks merchandise was a hot seller leading all the way up to opening night. Afterwards, not so much. While Force Friday has come and gone, the RealD 3D glasses were revealed in honor of the 100 Day Countdown to Star Wars: The Force Awakens. In just a little under four months, everyone will finally get to see Star Wars: The Force Awakens for the first time. RealD is the primary licensor of stereoscopic 3D technology, and are known for offering glasses based on whatever big blockbuster is coming out next. This past summer, RealD also released sets of glasses for Avengers: Age of Ultron and Jurassic World, of which both sets proved to be quite popular with moviegoers. As of now, RealD 3D hasn't released any substantial information on where or when you can pre-order your Star Wars: The Force Awakens 3D glasses, insuring that you have them in time for opening night. Previous 3D glasses released were sold in collaboration with theaters running film marathons. It's not yet known if there will be any marathons for the previous 6 Star Wars movies. The prequel trilogy did play in its entirety in 3D at Star Wars Celebration for the first time this past April. The three films have not played in 3D outside of that venue, though Star Wars: Episode I - The Phantom Menace was released in theaters by itself way back in 2010, when it was believed that all 6 films would get a 3D theatrical release. It's likely that the Star Wars: The Force Awakens 3D glasses will be sold in the same manner as the Jurassic World 3D glasses, though that has not been confirmed. Those glasses retailed for $24.99 for the set of four. That doesn't mean these new glasses will cost that same amount. It's also not yet known if you'll be able to pre-order the glasses with your advanced tickets or if they will only be available on opening day. More info is sure to arrive soon. While we wait, mull over these four glasses and decide which pair you get before your other three friends/siblings/lovers get a peek. If I were you, I'd call first dibs on the Kylo Ren glasses right now!